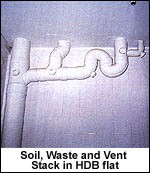 The Soil, Waste and Vent (SWV) uPVC Pipes are commonly used for Sanitary stack. They are largely utilised in HDB projects, Private Condominiums, Industrial & Commercial Buildings. These pipes are also suitable as rainwater downpipes and for other water discharge purposes. Available in white colour, the sizes range from 1-1/4" to 6" in diameter. uPVC Pipes for Soil, Waste and Vent Application to SS213: 1998 corresponding to BS4514, AS1415. The Internal and external surfaces of the pipes are clean, smooth and reasonably free from grooving and other defects. Joint by solvent cement welding, these pipes are used for above-ground installation. The tensile strength is at least 45mpa and the elongation at break is not less than 40%. Due to its impact strength, they are able to be installed in long length.